I'm hovering 80 feet below the surface thirty miles off the coast of Morehead City, North Carolina. In all directions I'm surrounded by large sharks. There is no other place I would rather be. There are so many sharks below me that I worry about inadvertently kicking one while looking the other way. High above me the largest sharks circle endlessly like jumbo jets hovering over a busy airport. My camera's memory card is packed with a ridiculous number of exposures and I can't stop smiling. I don't want to look at my computer because I know that my time is almost up. Instead I lower my camera for a brief moment and take it all in. Carefully fining my way through a narrow passageway in the dark interior of an old shipwreck I come face to nose with a large shark. Neither the shark nor I can swim very well in reverse so I sink to the bottom of the hallway and try to be small. Undisturbed by my presence, the shark silently glides over me close enough to touch. Figuring that I might as well take a picture, my powerful strobes illuminate the beast at close range. Now very disturbed, the shark bolts out of site with a loud CRACK of her tail. Kneeling on the sandy bottom at 110 feet I'm completely engulfed in a massive cloud of baitfish. The water is clear but there are so many fish that I can hardly see five feet in any direction. Suddenly the school nervously accelerates in one direction. Hundreds of small fish zip past me like snowflakes blowing in a blizzard. I ready my camera and right on cue a large shark emerges. I snap as many pictures as I can as she slowly cruises an arm's length away. In a moment she is gone. The baitfish relax and engulf me once again. I regroup and wait for this amazing spectacle to repeat. This big girl was circling above the World War II shipwreck of the Caribsea. She was just one of overfifty sharks in the area that day. There was a lot of bait around her and it was difficult to get a clear shot of her head. FI4.5,11125th, ISO-320 Nikon D70S with Tokina 12-24mm lens @ 12mm, Single Iketite DS125 strobe set forTTL. magnificent creatures in their natural habitat. North Carolina's resident sand tiger sharks hold a special place in my heart. I find photographing them enjoyable and rewarding. Best of all, it is pretty easy to do. 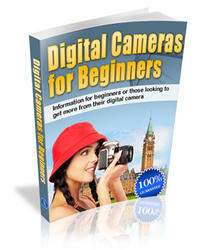 Even amateur photographers can capture stunning images. (Left) Sandtiger sharks hovering above a shipwreck, a common site in Morehead City, North Carolina. FI10, 11125th, ISO-320 Nikon D70S with Tokina 12-24mm lens @ 12mm lens, Dual Ikelite DS125 strobes setfor TTL. (Centre) This photo was taken in January of this year on the World War I wreck site of the Schurz. To say that there was a lot of baitfish that day would be an understatement. FI51I125th, ISO-640. Nikon D70S with Tokina 12-24mm lens @ 20mm, Dual Ikelite DS125 strobes setfor TTL. include everything from WW11 German U-boats, Black Beard's pirate ship, artificial reefs and several wrecks that no one has gotten around to identifying yet. Marine life includes massive schools of fish, rays, turtles, and of course sharks. Since the dives are conducted in the open ocean, there is no limit to what could swim by. The prime dive season extends from May to October. At this time, dive conditions are pleasant with water temperatures averaging 75F degrees and visibility averaging 80 feet. Typical dive depths range from 80 to 130 feet. Redundant breathing systems, NITROX computers and surface signaling equipment are the norm. Divers are typically allowed to plan and execute their own dive profiles. Experienced dive operators, like Olympus Dive Center, offer comfortable boats and professional service. For the photographer the selection can be overwhelming. The sharks are my favorite, and in North Carolina there are a lot of them. There are many species, but the Sandtiger Shark is most commonly encountered by divers. 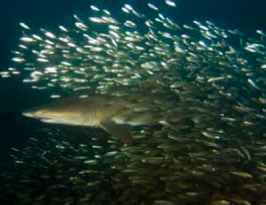 Schools of sandtiger sharks congregate year round near many of North Carolina's numerous dive sites. The wrecks of the Caribsea, Papoose (now known to actually be the W.E. Hutton) and the SPAR are popular and reliable shark dives. Sandtiger sharks can also be found around rock ledges and near just about any dive site in the area at some point during the year. The cooler waters of the winter months bring increased numbers of sharks. Some scientists speculate that they gather to breed. At certain times, more than a hundred individuals can congregate over one location. Sandtiger sharks are extremely tolerant of divers. Typically they are very well behaved. However they are large wild animals and should be treated with respect. It is not a good idea to touch them or spear fish around them. Each year thousands of divers of all experience levels dive with the sandtigers in North Carolina. Since no bait or chum is used, divers are offered the unique opportunity to observe these sharks behaving naturally in their aquatic environment. Sandtiger sharks, also known as grey nurse and ragged tooth sharks in other parts of the world, are popular in aquariums. They can grow to over ten feet in length and weigh more than 350 pounds. Sandtigers are found throughout a wide range of temperate waters and possess the unique ability to hover motionlessly in the water column. 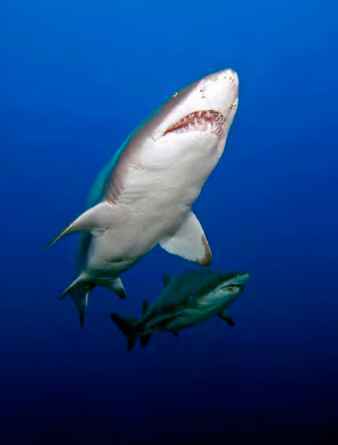 Like divers, sandtiger sharks use air to regulate their buoyancy. To do this they swim to the surface, open their mouth ridiculously wide and gulp air. This is a behavior that you have to see to believe. Sandtigers live long lives and reproduce slowly. They can be predictably located and readily captured. In the past this has lead to exploitation through over fishing and trophy killing. Sandtigers were one of the first shark species to receive governmental protection. In North Carolina, populations have rebounded to plentiful numbers. In the USA, sandtiger sharks remain federally protected. Despite this, they are occasionally killed by spear, sport and commercial fishermen. Sadly, when a shark is killed, the remaining school will leave the wreck site for months or even years. Where do they go? 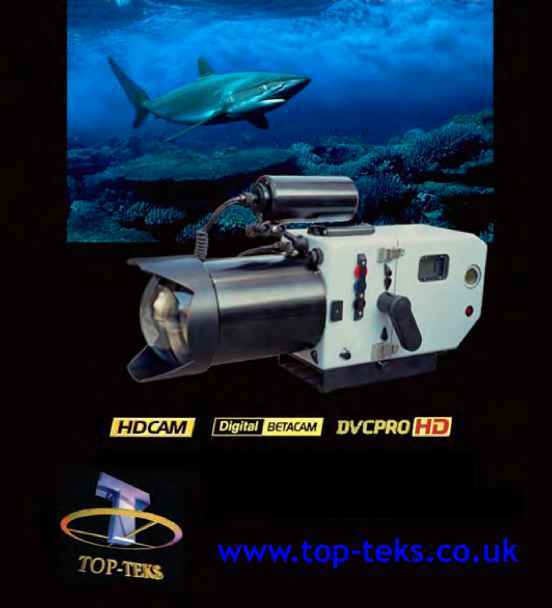 It seems as if sandtiger sharks were custom built for underwater photographers. Their visible teeth and large size make them high impact subjects that are sure to evoke a response from your viewers. They are extremely tolerant of divers and can be approached with relative ease. And, most appreciated by underwater photographers, they typically hover motionless in the water column allowing time for composition, metering and bracketing. Smaller sharks often have interesting spots on their sides. Sharks of all sizes often have grass visibly growing out of their teeth. Does this mean they have not eaten in a long time? the right angle so that they would launch inches over my head when I was not paying attention. (Far left) Captain John Thompson swims along side of a North Carolina sandtiger shark. John's pictures of me with the sharks that day were much better than the ones I took of him. Notice the scratches and scars on the side of this shark. Is this evidence of mating? FI5.611125th, ISO-320 Nikon D70S Tokina 12-24mm lens @ 12mm, Dual Ikelite DS125 strobes set for TTL. (Left) Captain Fred McCall swims the anchor down to the wreck. Olympus Dive Center's crew uses a fall face mask with underwater communications. Site conditions are relayed to the divers before they get in the water. This helps you decide - Wide angle or macro? Nerna Triplett enjoys one of her first encounters with sandtiger sharks. FI5.6 II 125th, ISO-200 Nikon D70S with Tokina 12-24mm lens @ 12mm, Single Ikelite until I can clearly see the nose hairs (they are actually black parasites around the shark's nostrils) through the view finder before I start firing off frames. Fast recycling strobes are extremely helpful allowing you to capitalize on your opportunities with multiple exposures. It is often easier to settle down in an area ahead of the shark's path and wait for it to swim to you as opposed to chasing after the sharks This strategy often results in more "head on shots." I also find it allows time for metering the water column and lining up an interesting background. Often just before the shark that is swimming toward you darts off, it turns its head to one side making for a dramatic pose. Sometimes the sharks hover high above the wreck midway down the water column. At these times photographers can hang onto the anchor line and swim out to meet the sharks as they approach. 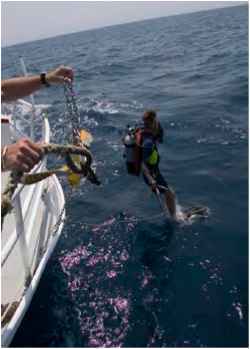 With good buoyancy control and some situational awareness (it is not a good idea to lose site of the anchor line) divers can extend their bottom times by taking advantage of the shallower depths. These mid water portraits often have the clearest blue water backgrounds. These sharks also tend to be the largest and are often accompanied by an entourage of pilot fish and remoras. At other times the sharks wander the interiors of the shipwrecks or lie motionless on the bottom. People are often surprised to hear how good the diving is in North Carolina. Although the area has had an established dive industry for several decades, it still feels like a well kept secret. The diving here is unique and you just have to experience it for yourself to fully understand. Maybe you are looking to add some dramatic shark pictures to your portfolio or maybe you are just interested in some outstanding wreck diving. Give North Carolina a try, you will not be disappointed.